13News Now meteorologist Evan Stewart answers your questions about the winter storm heading our way. I'm here - starting to answer questions - look for your answers as comments under them. 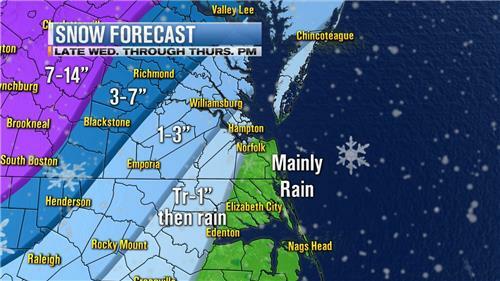 What is the predicted snowfall for Williamsburg as the totals keep increasing for Richmond ? What is the predicted amounts for Seaboard, east of 95? What is expected in Suffolk? So are you thinking the Peninsula will get enough to delay school on Thursday morning or does it look like it will be all gone by then? Seems like Newport News will not get enough to do anything with our schedule. Thoughts? So, what's really happening in Richmond. Got a son flying out of Richmond Airport midday Thurs...should he pack an extra pair of boxers? Thank you to everyone who is participating. If you are not seeing answers to questions, try to use a web browser besides Internet Explorer. IE users may not be seeing all of Evan's answers. We are working to correct this glitch. What are the chances we'll have freezing rain? That could be a big problem. What would your prediction of snowfall near the Saluda/Middlesex/Mathews area? All are 10 minutes from me. Hard to determine what we may actually get-Glouester Point gets different amounts from us. Thanks! Why do we constantly have to hear about NC? I live in Yorktown VA not NC but all of the weather forecast seem to focus on NC with our weather as a side story. I'm in North Myrtle Beach and need to get home to Virginia Beach. I was planning on traveling Wed., but can put it off till Thursday. would it be better for me to travel up 17 or take my usual 40 to 95 to 58? I have relatives driving in from DC tomorrow. What time do they need to be here by to avoid any snow? Im in Suffolk. This winter is ZANY!! Do you think the Peninsula will have school/base closing weather for Thursday or will the rain remove that from happening? Hey Evan, first of all thanks for all you do! What about Williamsburg?!! What kind of accumulation should we expect?!!! Please say hi to Janet Roach for me and Lasalle Blanks! Hi! I am currently in Jacksonville NC and need to head back home to Norfolk how bad would this weather impact my drive? It's been snowing since early this morning. Would it be better to return Thursday? Thanks! Any reason for VB schools and or Navy Instalations to delay or close this week? I take US 17 N from Jacksonville NC to Norfolk - how bad would my drive be either tomorrow afternoon or Thursday Around noon? When is the snowfall expected to hit in Hampton Roads? What is Virginia Beach oceanfront/Oceana area supposed to receive in regards to snowfall? What is Virginia Beach, Oceana area, supposed to receive in regards of snow accumulation? Have you heard anything from the local school divisions in Hampton Roads regarding weather closings? How many inches virginia getting ? Here's the current snowfall projection map. Keep in mind we will see a changeover to rain in most spots east of I-95. I am scheduled to fly out of Norfolk on Saturday going to Tennessee, do you think my flight might be canceled due to this weather? I am watching the Chesapeake City Council meeting where there discussing dog tethering law but anyway, do you if this snowstorm will impact travel in Hampton Roads because I need to decide if I need to leave work early tomorrow?